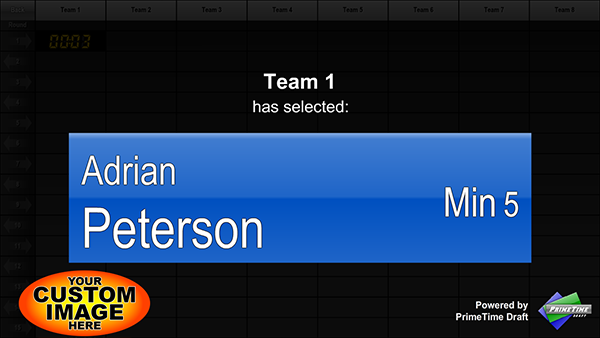 If you want to make fantasy sports drafts part of your commercial business, we can help. Corporate customers that want to use PrimeTime Draft as a component of a for-profit service of their commercial business must purchase a Commercial license. In addition to granting permission for commercial use, a Commercial license enables PrimeTime Draft to display an optional custom image, company logo or branding during the draft. The Activation Code you receive with your license purchase is intended for you to use when installing PrimeTime Draft on your company-owned computer. You can either manage the draft for your customer or allow a customer to manage their draft on that computer. If you intend to use PrimeTime Draft on multiple systems, a separate Commercial license is required for each system. For volume licensing or additional information, please contact us.